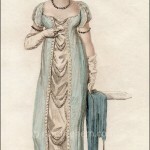 La Belle Assemblée, April 1810. I find it interesting that the majority of prints in my collection from 1810 show long sleeves, both for day and evening wear, and throughout the seasons. I am reminded of Mrs. Bennet in Pride and Prejudice bemoaning the fact that long sleeves were back in fashion. However, the dark pink dress on the left, looks as though the long sleeves were detachable. Although the print is labeled “Evening Dresses,” I would guess these ensembles are half dress, or even half full dress, rather than full dress. 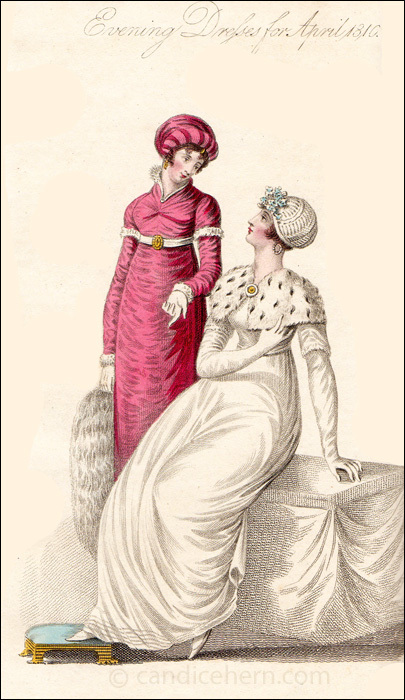 The necklines are quite high for formal wear, and the hats lend a hint of informality not seen in full dress. “No. 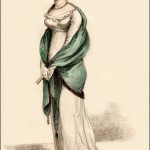 1–A robe of amaranthus figured sarsnet, made to sit high in the neck, with a full cuff of lace; long sleeves with short loose tops trimmed with swansdown. A turban of amaranthus crape and velvet. Gold brooch and earrings. Swansdown muff. White kid gloves and shoes. Hair in light ringlet curls.